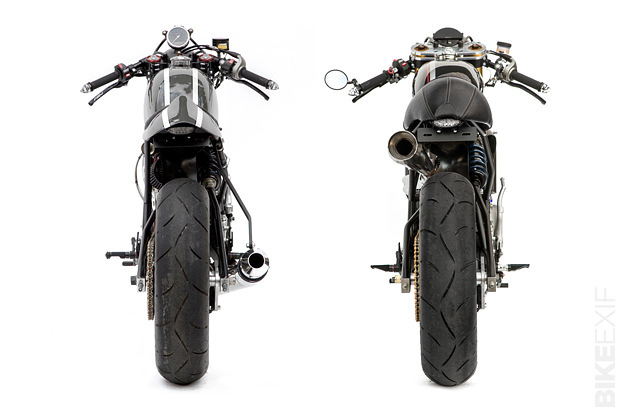 ‘Boodaak’ (above and below) and ‘Dakdaak’ are hand-built, motocross-engined café racers tuned for the track and fully competition-capable. Both motors were custom tuned by Jim Wood at Southland Racing Products. 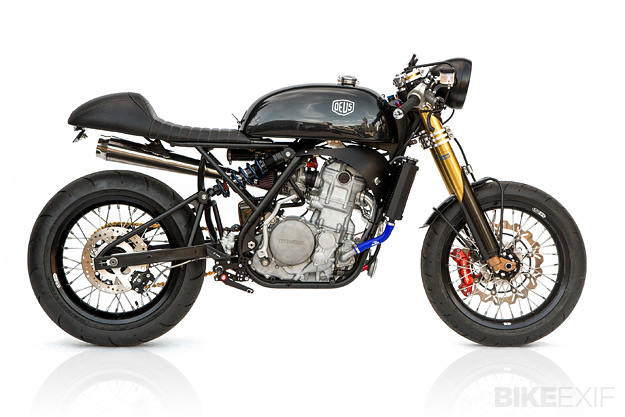 Boodaak is powered by a HRC Johnny Campbell spec Honda XR650R motor with oversized valves and a Carrillo rod, while Dakdaak (below) runs a Honda CRF450X Stage Two motor with two-millimeter oversize stainless steel valves for longevity. 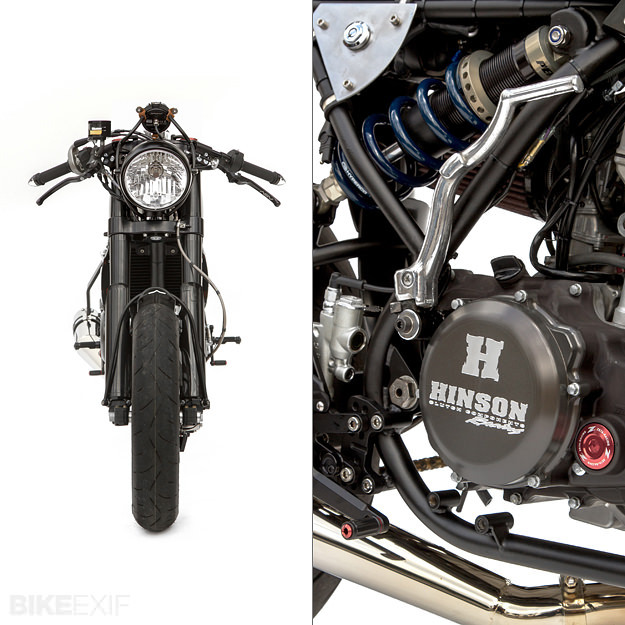 Hand-made chromoly frames and custom chromoly swingarms keep things moving in the right direction, with serious stopping power coming from Beringer six piston brakes up front and Brembos in the rear. The aluminum gas tanks are hand-fabricated, there’s a sprinkling of classy Rizoma parts throughout, and the custom-made seats are clad with Kushitani leather for maximum comfort in the saddle. Bridgestone Battlax BT-003 rubber provides reassuring grip on both bikes, and the suspensions have been tuned by Ed Sorbo at Lindemann Engineering. And the names? Apparently they’re derived from the sound of the engines as you roll on (boooo) and off (daaaak) the throttle. I bet they’re as fun to ride as they are to say. 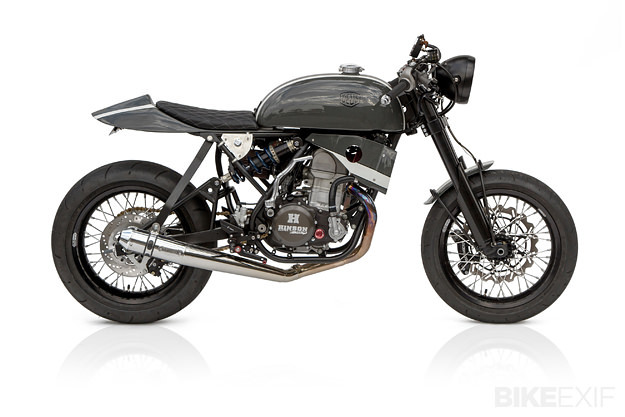 More details of the bikes will be on the Deus website soon; meanwhile, keep track of the Deus Customs USA operations via their Facebook page.